As the City of Abbotsford showed its new tartan at the Canada Day celebrations, modeled in kilts and shawls worn by local celebrities (including UFV president Mark Evered), representatives of UFV looked on with pride. Fashion Design student Samantha Merritt was particularly excited, as she was the designer of the new civic tartan. 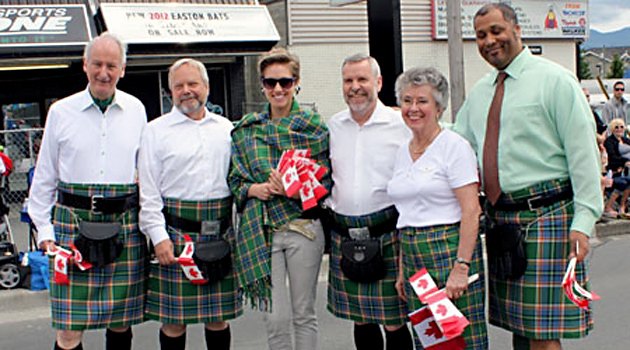 It all started when Christine Wiebe of Volunteer Abbotsford came up with the idea that the city should have its own tartan. She researched protocol with the official tartan registry in Scotland, and approached City Hall for approval and funding. Once she received the go ahead, she turned to the Fashion Design department at UFV for help with the tartan’s design. Fashion Design program head Deanna Devitt was delighted to take up the challenge and conferred with her colleagues about who would be the most appropriate designer. Merritt had already learned about the creative and technical process of putting fibres and textiles together, and weaving and dying them, in her textiles and weaving courses. She was given the design parameters, which included that the tartan have six colours, all representing different aspects of Abbotsford: white is for the dairy industry; red for strawberry, raspberry, cranberry, and brick industries; blue for aviation and blueberry industries; green for both the university and the fertile, green valley; yellow for daffodil and corn; and black for the blackberry industry, rail and road. She used a computer program to help with the designs and colours, and learned as much as she could about tartan design in a self-directed crash course, with help from the Scotweb website. She presented several options to city council in the spring, and they chose one for production. Wiebe then submitted the design for registration in Scotland. Once the registration was accepted, the design was sent to a tartan maker and several garments were produced, which made their debut on Canada Day. The new tartan, which was registered on April 7, has a pattern called a Sett, which is eight inches long and 288 threads.